Conair Hot Sticks curlers are long, slender, self-locking curlers that can be used to create tight spiral curls or gentle loose waves. Unlike foam rollers, Conair Hot Sticks do not require you to leave them in overnight, and, unlike traditional hot roller sets, the Hot Sticks do not use clips or pins. Using the Hot Sticks is about as easy as using regular curlers--it's just a tad more dangerous. 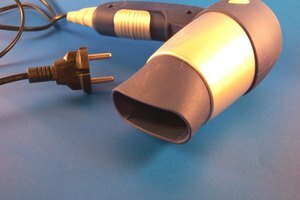 Plug in the Conair Hot Sticks unit, and wait for the curlers to heat. 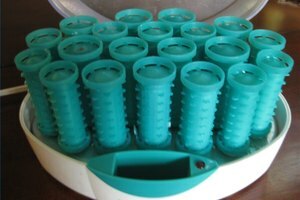 This usually takes 10 to 15 minutes, or until the heat indicator on the Conair Hot Sticks unit has changed color. Apply the thermal styling spray, dispersit it throughout the hair. Section enough hair for one roller, grab one of the Conair Hot Sticks from the end and roll the hair around the Conair Hot Stick, continuing to roll to the scalp. Secure the Conair Hot Sticks by crossing one end of the roller over the other, creating a loop. Repeat with the rest of the hair until all of the Conair Hot Sticks have been used. 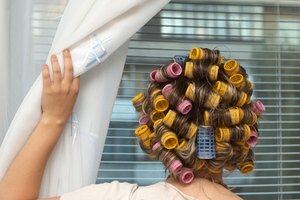 Allow the rollers to cool between 10 and 15 minutes before removing. Style hair as desired, using a comb, pick or fingers. To get a traditional roller set from Conair Hot Sticks, hold the Hot Stick parallel to the hair before rolling. To achieve a spiral roller set from Conair Hot Sticks, hold the Hot Stick perpendicular to the hair before rolling. Smaller sections of hair on the Hot Sticks will yield tighter, curlier results. 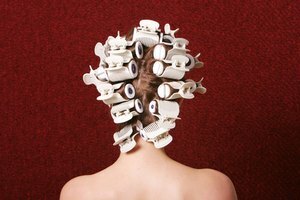 Larger sections of hair on each roller will result in looser, wavier curls. Thermal spray helps protect the hair from heat damage while also increasing hold.